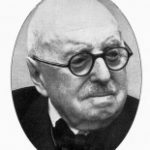 Impressario Henry Bettesworth Phillips was born in Athy, Co. Kildare on 23 December 1866, the third child of Henry St John and Jane Phillips. In 1877 he won a scholorship as a boy soloist in St. Columb’s Catherdral Londonderry and from 1879 to 1882 attended Foyle College. In 1890 he set up his “Piano and Music Salon” in Marlborough St in Londonderry, moving to “Beethoven House”, in Shipquay St sometime before 1899. Phillips organised his first Concert on 8 October 1891 in the newly opened (1890) Guildhall, presenting the Hungarian-born violinist Tivadar Nachez. He organised a ballad concert in Omagh in March 1892 and a Concert in Armagh in October the same year with the Welsh tenor Ben Davis. Between 1896 and 1903 he controlled Derry Opera House. In 1904 Phillips married Annette Prior and they had two children, Ailne (Babs) and Ian Henry (Peter). 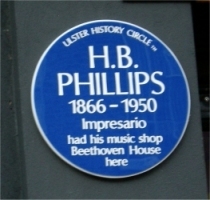 In 1907 he opened a second music shop in Belfast at 2-4 Bedford Street; also called “Beethoven House”. In December of that year he organised the first of three visits of the Halle Orchestra conducted by Hans Richter, the others being in 1909 and 1911. Phillips brought the Halle to Belfast on other occasions; March 1912 (Sir Henry Wood), April 1913 and March 1914 (Hamilton Harty). Perhaps Phillip’s greatest achievement was bringing the most clebrated artist of the time, Enrico Caruso, to Belfast on 9 September 1909. Phillips moved to England in 1912 but retained his shops and his business interests in Ireland. In 1923 he acquired the Carl Rosa Opera Company and ran it until his death in 1950, during which time it provided most of the opera heard outside London. Londonderry too had its share of his efforts and 1936/36 saw formidable display of musical talent; Count John McCormack (October 1935), Fritz Kriesler (January 1936) and Paul Robeson (February 1936). Philipps was made CBE in 1948. 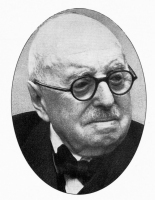 He died on 19 March 1950. There is a memorial to him and his wife on the south wall of St. Pauls Church, Covent Garden, London.